I wasn't bleeding or broken, and I certainly wasn't in any real pain. My own mother wouldn't have feared for my health. In the old days she would have asked, "Which class is your test in?" and laughed, before sending me off to school. I had what is (probably) known amongst health care professionals as an "itchy, scratchy, sore throat." Terrifying, I know. Perhaps some people don't take a sore throat very seriously, but I do — at least from October to December. It's during this period of time that I seem to get very sick, every single year. I catch a cold, or the crud as I call it, in the late fall and it keeps me out of commission until at least the beginning of February. This horrendous condition has ruined every single winter season for the better part of the last decade. This is the cold that I was trying to avoid this year. I had bought new skis, scoped out some great winter trails and printed out directions for how to make an igloo. I would do anything to skip being sick this year. He came back with what appeared to be enough ice climbing gear for a team of hamsters. After waking up with the "itchy, scratchy, sore throat", I turned my entire house upside down. I sought every powder, pill, paste or potion that might offer some relief. Two hours later, with a belly full of every snake oil on the market, I grudgingly bit the bullet and made an appointment. I swallowed my pride and trudged toward a ridiculous meeting where I would have to explain all of my "symptoms". Having only one imperceptible symptom, I would need to expound further. "Doc, you don't understand — this sore throat is more than just an inconvenience. It's a warning." I explained. "Or maybe, maybe…it's a reminder. Or even, a threat!" Pondering the plausibility of my immune system's use of thought, reason and planning, I must have left my mouth wide open in awe. My doctor let out a chuckle and stuck a tongue depressor in my mouth. "Well, let's take a look." After checking all of the orifices on the front of my head, he flicked the popsicle stick and his gloves into the trash can with a practiced fluidity. Barely missing a beat, I continued explaining how for the last six years I have gotten a sore throat and not rested it. Some mothers (my mother) might even warn, "You're going to overdo it!" At which point it is much too late and I have already become deathly ill for the better part of the winter. Some of the activities which may (or may not) have contributed to my "over doing it" include: The Great Frozen-Lake-Ultimate-Frisbee Championships of 2009, Booze-Luge (which is not nearly as safe as those wussies who luge on a real track) and the most common: one last backpacking trip before the snow falls. Having already moved on to my ears, Doc interrupted my blabbering with one sharp move of that little scope. I don't know which of us was startled more by my reaction, but I came off that table like it was white hot. After a couple exclamations and expletives, I sat back down and he apologized. Apparently he hadn't been expecting to find a mine field inside my ear canal. He explained that I had External Auditory Canal Exostoses (EACE), and even worse, he was going to have to check the other ear too. With a little more caution, he carefully checked my right ear. Same thing. Jacob paddling Lake Chatcolet, ID, before he learned about his EACE. EACE is the formation of new bone, an exostosis [ex-os-stoh-sis], underneath the thin skin of the ear canal. In more extreme cases, it can block the entire canal. However, even partial blockages can cause hearing loss and trap water and debris, which can cause painful ear infections. When this condition is caught early, it can be easily dealt with in about an hour, with no big expenses. If it is not caught early, these spurs can become so big that fairly major surgery is necessary. One form of that surgery involves an incision made on the back of your ear, allowing the outer ear to lie over on top of itself. This procedure gives complete access to the auditory canal and the exostoses. Or, some surgeons go right down through the ear canal itself; like un-building a ship-in-a-bottle. I couldn't believe that I had boney spurs that were growing right next to my eardrum. How could I not feel that? How could this be? I was even more dumbfounded when my doctor began asking me if I grew up next to a lake or river. Did I kayak, surf or swim in cold water often? After answering "yes" to every one of those questions, he told me that EACE is commonly known as "Kayaker's Ear" or "Surfer's Ear". He went on to explain that after years of repeatedly shocking my ear canal with frigid water, it had grown these boney spurs as a type of defense mechanism. Surprisingly, he said it doesn't take too much exposure to the cold water for this to start to develop. Having your head under water for even just a moment while you roll your kayak is all it takes. Do that a few hundred times over a period of years and you are at risk for EACE. My doctor told me that it was extremely lucky that we caught this so early. Typically, this is a condition that isn't noticed until it becomes a big problem. In my case, they caught it early enough that he would be able to go in with some small tools and break them up without surgery. Breaking up the pieces and flushing them out with hot water would not be enjoyable. Compared to the alternative, I was actually oddly excited. He left for a few minutes and came back with a nurse and what appeared to be enough ice climbing gear for a team of hamsters. There was a tiny pick, a tiny ice axe and even some comically undersized pitons. These were the tools to be jammed all the way up against my eardrum and used to smash up the bone growths. The doctor said it may sound a little loud, and it may feel "a bit tender". While "tender" is not the word I would use to describe the sensation, it certainly wasn't worse than a bad day at the dentist. When all was said and done, I had both ears cleared out and thoroughly cleaned after the exostoses were broken up and removed. Because of their prolonged stay, the tiny spurs had given me ear infections in both ears, which I had to get a prescription for. After I took the prescription, I wouldn't need any further treatment or any medications. I was told to make sure to have my ears checked every once in a while, but the condition usually takes years to develop, so I should be in the clear for quite some time. This is clearly a condition that can be avoided with preventative care. We literally can't keep Jacob out of the water. I did a little research on EACE and found that a study by the University of Wales Institute found that 69.5% of kayakers were found to have some exostoses, compared to only 1.7% of non-kayakers in the control group. They also found that the severity of EACE was clearly associated with how long and how frequently individuals kayaked. 90.6% of those who had paddled for more than 10 years had EACE. 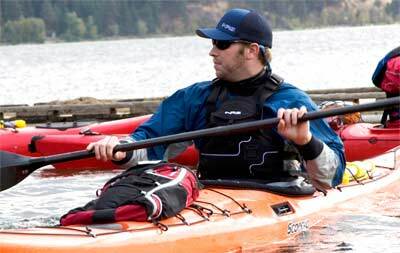 Ironically, prevention of kayaker's ear is very easy — keep the cold water out of the ear canal. All you have to do is wear earplugs. If I had worn earplugs, this wouldn't have happened. Simple as that. Many people also recommended wearing a snug-fitting neoprene cap over your ear plugs as well. Perhaps the most amazing part of this experience came when I mentioned the exostoses to my friends. I was appalled to find that none of my paddling buddies had ever heard of it either. I can't imagine a group of middle-aged tennis players who had never heard of "tennis elbow." Yet this group of kayakers had never heard of their namesake condition. As I look back upon that day, I am still amazed. This was a condition that I had never heard of, knew nothing about and didn't realize I had. For less than a tank of gas, I was able to get it diagnosed, cared for and saved from the trouble of a major surgery. As I paid the pharmacist for the eardrops prescribed to me, I asked her, "Are these the cherry-flavored ones?" She and I both laughed, igniting a coughing attack that nearly buckled my knees. When I finally caught my breath, she said, "You should really see a doctor about that." If you want to see what's involved with one form of surgical correction of Kayaker's Ear, take a look at this YouTube video. Warning: It's surgery! There's blood and everything. Not for the squeamish. Hey, you've been warned. Cover up those ears; keep that cold water out of them. The hearing and suffering you save may be your own! 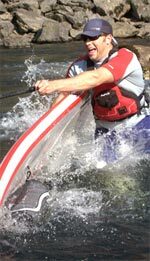 Jacob is a sea and whitewater kayaker, rafter, former guide, photographer and general all-round outdoor nut. He creates our online graphics, manages photo shoots, and like most of us, wears multiple other hats.